I started cycling in 1995 as a way to get back into shape. I had no idea how addictive it could be! Shortly thereafter, I joined a local mountain bike club, Mid-Atlantic Off-Road (MORE). I learned SO much in such a short period of time, I decided to try my hand at racing the following year, and loved it! 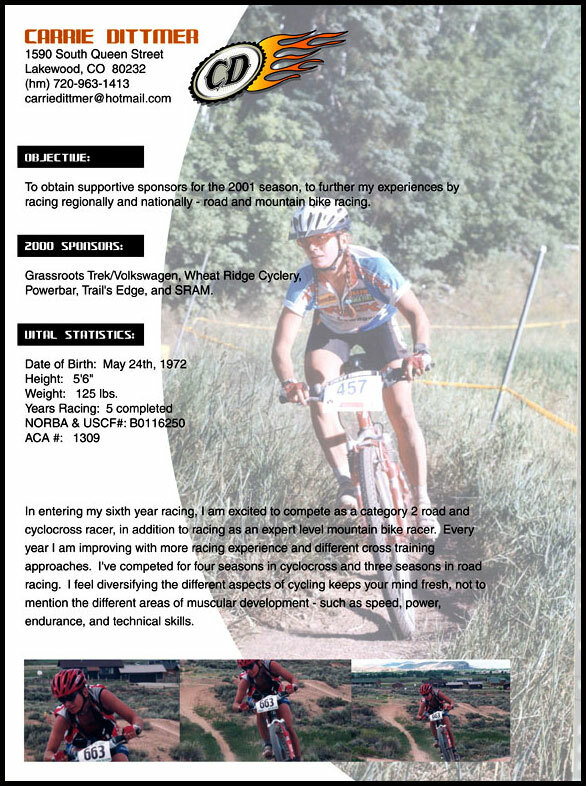 (Click on the image to view my 2001 race resume). A little bit of background on myself, growing up I had two horses and rode them competitively. I owned a quarter horse (Jake), and a thoroughbred (CB). With my quarter horse, my favorite was competing in timed events (barrel racing) then the thoroughbred, I loved to jump. Being a member of the local pony club, we competed in three-day events in which I was introduced to cross-country events. This was following a map on an open course, where you raced through open fields and jumped numerous natural-looking objects. Jake LOVED to gallop through the open fields so much, I had to use a kimberwick bit on him to help control him! I tried doing cross-country with CB, but he was a little spooky. One time, I was getting set-up for a jump, but at the last minute he veered off to the side. I think I hit the jump, then got stuck in the stirrup, while being upside down! Everyone walked away, but I learned everyone as their own unique talents. Cycling was an easy transfer of skills for me and I learned a bike was a lot cheaper to maintain than a horse. In 1997, I made the move from Virginia to Colorado, and immediately jumped into cycling, but soon I realized it was way more competitive than racing in Virginia! The women’s field was actually a competitive size. I quickly learned that to be good at mountain biking you also need the element of road riding. I raced in a criterium or two, then looked for a team to join because road is completely different than racing mountain bikes as the element of strategy and teamwork, comes into play. I joined the Boulder Women’s Cycling Team, which at the time, was one of the few, all-exclusive women’s teams in the area. I learned A LOT from skills clinics and practices, and eventually I earned the upgrade to Category 3, then Category 2! At the same time, I was racing Expert-level in mountain biking. It was all about balancing my time with training, working, and finishing my Bachelor of Science Degree. For 2018, I’ll be representing VIDA MTB Series as an ambassador, riding a Yeti mountain bike and getting rowdie with the Colorowdies. 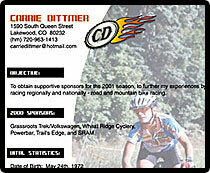 We are also supported by Golden Bike Shop, Guide Pro, Honey Stinger, Smith Optics, and others!